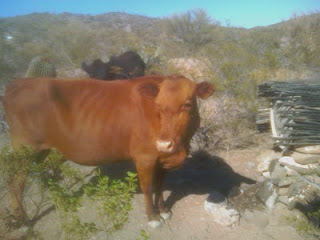 I just spent eight days deep in the Arizona desert in complete solitude and silence. There was barely a sound. I heard an occasional bird, the sound of a lizard running through the brush and the wind, but that was it! No other sounds and no words spoken by me (I didn't start talking to myself) and no words spoken to me. There was a one time exception to this - I was sitting in the sun, dozing off when suddenly not 10 feet from where I sat I heard a resounding MOO! I looked up and I was surrounded by a small herd of free wandering cattle! I looked at the cow and said MOO! So much for a deep conversation... As I pondered a week away from noise and words I have wondered about how much of my talking is no more substantive than saying MOO. How many of my words are spoken with intent and thought, In how many of my conversations do I speak words which minister encouragement, life, challenging thinking, mercy... words that truly touch and linger. The Scriptures have much to say on our speech and words: Eph. 4:29 "Let no unwholesome word come out of your mouth but only such a word as is good ..." 2 Tim. 1:13 "Retain the standard of sound words." Eccl. 5:7 "In many words there is emptiness." Prov. 16:24 "Pleasant words are a honeycomb, sweet to the soul" Eccl. 5:2 "God is in heaven and you are on the earth; therefore let your words be few." James 1:19 "... be quick to hear, slow to speak..."
I'm not suggesting that we all take vows of silence or that we cease our friendly conversations but I am learning that voice and words are a gift from God and are a powerful and wonderful thing. They should encourage, challenge, delight, declare the truth and beauty of the Savior and be evidences of a heart transformed by Jesus. I am fearful that if I erased from my day all the words spoken that had the value of my conversation with the cattle - there might be very little left.